With the published “ETERNALBLUE” vulnerability (CVE-2017-0146) a few months ago, the effects finally trickled down to the default settings for samba in CentOS 7. After updating to samba 4.6.2, I was unable to access my samba share from a Windows client (using my freeipa credentials). After lots and lots of research, I finally found the answer at the FreeBSD forum! Gotta love the FreeBSD folks; they keep us all sane and grounded in free and open computing. Just add ntlm auth = yes to your [global] section of smb.conf! 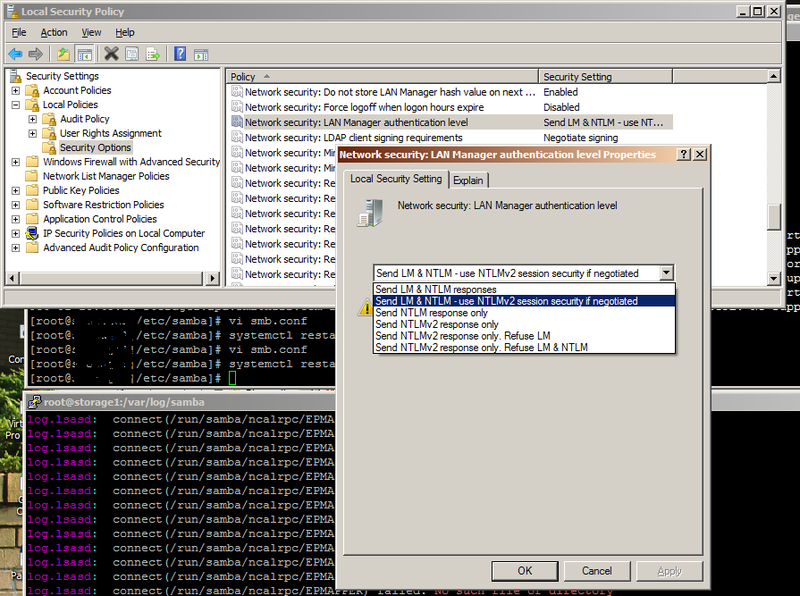 However, I looked it up and that enables samba to accept ntlmv1, which was the vulnerable protocol based on that CVE I mentioned earlier in this article. I wanted to find out how to stick to ntlmv2 authentication, if possible, and I did discover it! You can just configure your Windows clients to use the more secure settings either using the registry or the graphical secpol.msc tool. I recognize this location from when I’ve adjusted it in the past, at a place that would not have been affected by this vulnerability or its remediation because they were forcing NTLMv2 years ago on the workstations.